What’s my favorite thing about spring? All the spring vegetables, from artichoke to zucchini. But the ultimate luxury must be asparagus. It’s in peak season and often on sale. Sing it with me. This is the dawning of the age of asparagus. Age of asparagus. Asparaguuuus! 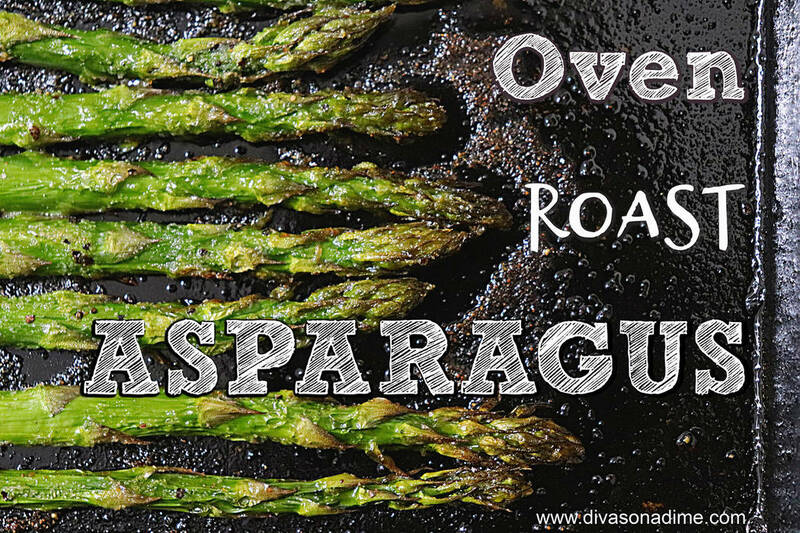 (Patti Diamond) One way to prepare asparagus is to oven roast them for about 25 minutes until tender. Be sure to save the tough ends for soup. If you’re looking to save money on groceries, then you’ll want to use every part of the produce you’re buying. We’re going to use every morsel of your asparagus, even the tough ends. We’ll oven roast the stalks in a way that makes the tips delectably crisp. The ends are staying out of the compost and onto the table with asparagus ends soup. While available year-round, asparagus is in season from February through June, with April being the peak. Asparagus is also low in calories and packed with vitamins C, A and K, high in folate, minerals and antioxidants. When buying asparagus, look for firm stalks with bright color and closed tips. It’s best to eat asparagus the day you buy it. If that’s not possible, store asparagus in the fridge with a damp paper towel wrapped around the bottom of the stalks and it’ll last a couple of days. To prepare asparagus, rinse in cold water and snap off the bottom ends of the stalks. Reserve the ends to make soup. You can cook asparagus many ways. Boil or steam until just tender, 3 to 8 minutes depending on thickness. Braise, grill or stir-fry your asparagus. The easiest method is to microwave. Place asparagus in a microwave-safe baking dish, add ¼ cup water and cover tightly. Microwave on high until tender, about 4 minutes. My personal favorite is to oven roast asparagus (pictured). Preheat oven to 400 F. Lay the asparagus on a sheet pan and brush with olive oil, being especially liberal on the tips. Generously season with garlic powder, onion powder, salt and pepper. Roast for 15 to 25 minutes depending on the thickness of the stalks. The tips turn out beautifully crisp and the stalks are caramelized and tender. In a medium saucepan, cover the asparagus ends with water by 1 inch. Bring to a low boil for one hour. Let cool. When cool enough to touch, use an immersion blender to puree the softened ends as much as possible. Stop often to carefully clear the tough fibers from the blades of the blender. Strain the puree through a fine mesh strainer, pressing and squeezing the pulp to extract as much liquid as possible. You should have about 5 cups concentrated broth. Now the pulp can go into compost. Chop the potato into ½ inch dice and add to broth, add salt and bring to a boil. Simmer until potato is soft, about 25 minutes. While the soup cooks, clean your immersion blender, making sure to clean fibers from under the blades. Puree the soup until creamy. Add remaining ingredients. This soup makes a great first course or light lunch. Do you have the song “Age of Aquarius” stuck in your head, too? You’re welcome. Lifestyle expert Patti Diamond is the recipe developer and food writer of the website “Divas On A Dime – Where Frugal, Meets Fabulous!” Visit Patti at www.divasonadime.com and join the conversation on Facebook at DivasOnADimeDotCom. Email Patti at divapatti@divasonadime.com.